I only had a one day session after guiding on the river Wye for 2 days more of that later. The sun had been beating down relentless for the last 3 weeks no rain and no cool weather at all. 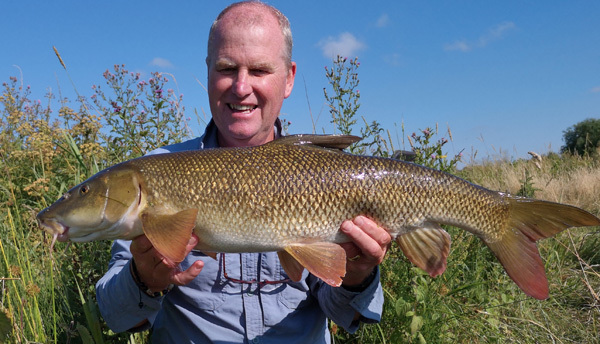 People were getting worried about the welfare of barbel on the Trent, Severn and Wye. Some fatalities were accruing where irresponsible anglers were not resting fish up in the low oxygenated rivers. The Avon though was still about 21c which is still cool, however nobody should be complacent in handling barbel. It’s interesting that the salmon syndicate had a rule last year that salmon fishing would stop at the river being 20c. This year it was reduced to 18c as returning them at this temperature means they have a better survival rate. I had a score to settle in one swim where I had lost a large barbel before. There were plenty of chub in the swim but the occasional barbel could be seen flashing on the bottom. One was a large fish. Again I baited up with pellets and the chub and barbel came out to play. First fish of the day proved to be a lovely little barbel of 9lbs 1oz. So with a quick photo she was rested and back in the river in no time at all. Then 2 more smaller chub came my way these were about 3lbs or so. Things then started to quieten down and the heat of the day and the disturbance had an impact. So I decided to move swims, again to another part of the river where I had seen some good barbel and chub. I saw 4 barbel feeding in a tight area I cast in a couple of times but never got a hook up. I then saw another good barbel about 30 yds upstream together with a couple of chub. I dropped the rig into the river at my feet not making a sound after the barbel and chub had moved out. I lay the rod down on the bank with the free spool engaged. The barbel came and fed on a few pellets then the chub came out. Then they disappeared quickly. I looked at the reel and could see the line clip being rotated on the reel it was either weed or a fish. Sure enough it turned out to be a nice chub of about 5lbs. That was the end of the day for me. A tricky one for sure however any barbel caught from the H. Avon is a great result. This entry was posted on Tuesday, July 31st, 2018 at 5:37 pm	and is filed under Uncategorized. You can follow any responses to this entry through the RSS 2.0 feed. Both comments and pings are currently closed.